More and more, I just make stuff up when I'm cooking. I start with an idea, look in my cookbooks (Eat My Books is a handy tool for this), or more normally, just google the idea. The idea that started this was a roasted cauliflower dip. I found a recipe or two, make some modifications, and it came out tasty, but a pretty unappetizing color. So then I thought -- carrots! That will be pretty (after all, dips are party food and it can't just be a grayish/beige blob). For flavor inspiration, I riffed on the roasted carrot with yogurt sauce side dish at Stake, our local (excellent) steak house. Found more recipes... I would say this one was guide that I used, but changing things that need to be changed because I wanted it to include yogurt. And I didn't have any Harissa. It came out good. The problem is that at some point later in time, I want to make it again. So I'm trying to remember what recipe(s) I used for a base (did I clip it in EverNote? was it a cookbook? ), what did I do different from the recipe? At which point I think about writing it down. Which is good, but if I want to post it, I feel obligated to include cooking times and measurements. So then I will make it again, make notes of measurements and times. But be aware... my notes are often just estimates. But I don't really feel too bad about this, because you need to cook things until they are done, which will vary depending on your oven, the freshness of the vegetables, how things are cut, and a thousand other variables. And the same goes for how things taste... the age and variety of vegetables, the type of yogurt, all will affect the taste. Then there is your taste .. how salty or spicy do you like things? Bottom line, use this as a guide. Don't hesitate to adjust as you see fit. Preheat oven to 425F, convection roast if you have it. Place a piece of parchment paper on a sheet pan. If using large carrots, peel, but if using smaller/fresher carrots, just scrub. Split carrots if large. Put carrots and garlic on sheet pan. Drizzle olive oil over (note – I never measure), and sprinkle with spice rub (maybe a ½ teaspoon.. again, I don’t measure). Toss with your hands to get everything evenly coated. Spread out carrots; put the garlic in the center. Wash your hands, then put the pan in the oven. If using convection, turn the carrots and garlic every 10 minutes or so. The garlic will be done first, in about 20 minutes. (The garlic is done when it is soft.) The carrots should be done in 25 – 30 minutes. 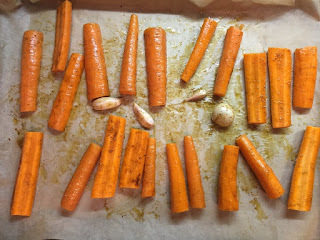 The carrots are done when they are soft and edges are starting to brown. If not using convection, turn every 15 minutes, and they will be done in 30 – 45 minutes (again, the garlic will be done sooner). Let the carrots cool. Squeeze garlic out of its skin into a food processor. Add carrots and remaining ingredients (start with ¼ to ½ teaspoon of salt, and a good grind of pepper), then process until fairly smooth. Taste .. add more salt, lemon juice, yogurt, or spice rub to suit your taste. Serve with crackers, pita, or bread.